When you stay at John Jack 4 McCloud's Accommodation in Chrissiesmeer, you'll be 14 minutes by foot from Lake Chrissie. The front desk is staffed during limited hours. Free self parking is available onsite. 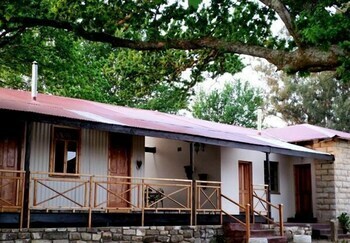 With a stay at Big Sky Cottages in Wolseley, you'll be within the region of De Oude Church and Saronsberg Theater. Free self parking is available onsite. When you stay at Keurfontein Country House in Willowmore, you'll be 14 minutes by car from Baviaans Tourist Center. Free self parking is available onsite. When you stay at The Wolfkop Nature Reserve Cottages in Citrusdal, you'll be next to a golf course and within a 5-minute drive of Citrusdal Hospital. Free self parking is available onsite. With a stay at Woodmead Guest Lodge in Sandton, you'll be within a 15-minute drive of Montecasino and Kyalami on Main. Free self parking is available onsite. With a stay at Studio Colorato in Cape Town (Camps Bay), you'll be convenient to Theatre on the Bay and Table Mountain. Self parking (subject to charges) is available onsite. Located in Oudtshoorn, Terra Bianca is a 3-minute drive from C.P. Nel Museum and 7 minutes from Cango Wildlife Ranch. Free self parking is available onsite.